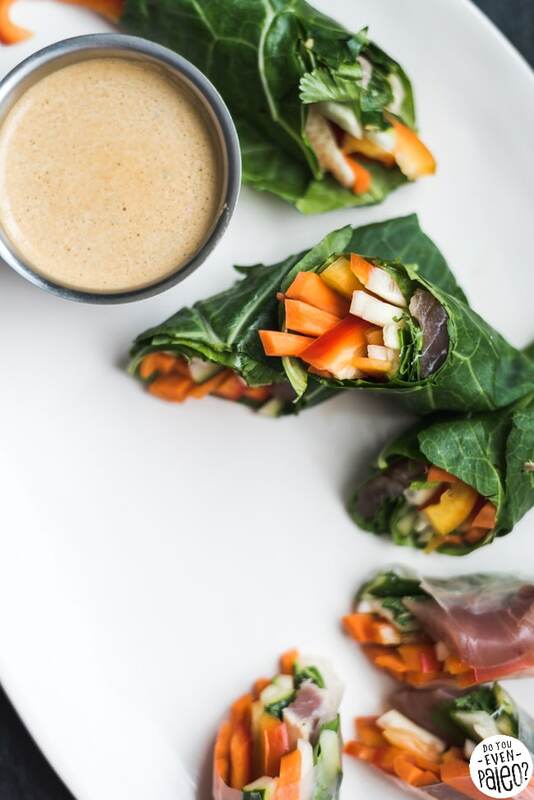 Paleo Tuna Spring Rolls — little bundles of fresh veggies and fresh tuna fish wrapped in collard greens instead of rice paper wrappers! It’s the Whole30 way to enjoy these dunkable rolls without skimping on flavor. Because I haven’t even mentioned the sauce yet… and let me tell you, it’s a winner. Of course, you can still use rice paper wrappers if you want. I did, mostly because I wanted to see if I could roll them up correctly. Every once in a while, I find that I’m not eating enough veggies. I look at my meals and wonder how I let my food priorities slide so much that I straight up omit plants. (Okay, I’m exaggerating a little bit, but I’m sure many of you can relate! Somewhat recently, it happened again. I’d gotten a little bored of roasted veggies, so I stopped making them… only realize that I wasn’t eating salads or greens. What the heck? Then on a weekend visit to my parents’ place, my mom set out a platter of raw veggies to snack on. Nothing fancy, just mushrooms, bell peppers, radishes, grape tomatoes. The man spouse and I absolutely demolished those veggies. And not by “grazing,” either. We practically made a meal out of those veggies simply because we enjoyed them so much. Somehow, in the mess of life, I forgot how freaking delicious raw veggies are. Why make it more complicated than it has to be? This is the perfect recipe to utilize raw veggies outside of a salad. 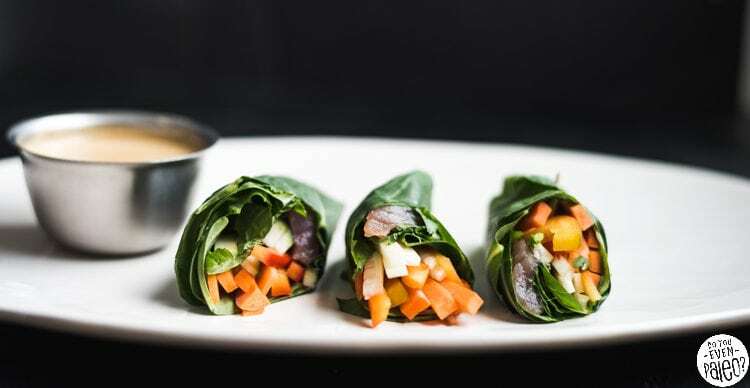 After all, except for the tuna, these tuna spring rolls are constructed entirely of veggies! To me, collard greens are an excellent sub for rice paper wrappers. 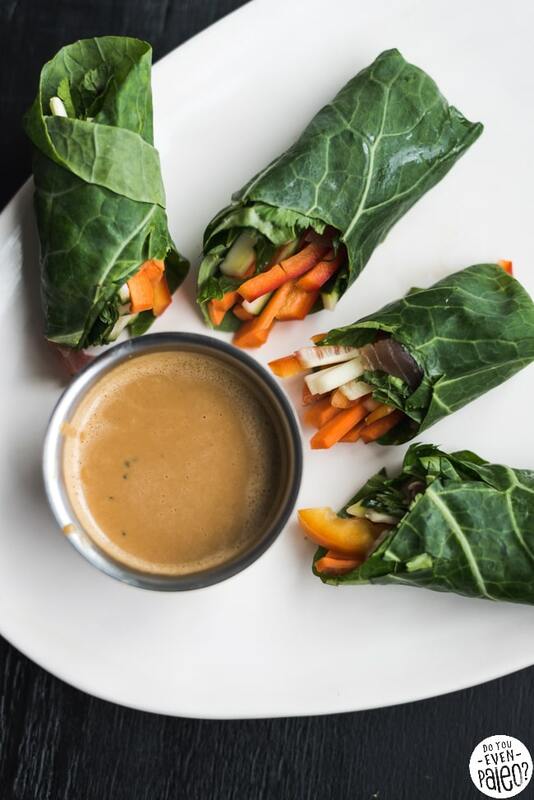 I’m typically not a huge fan of collard greens, but in wrap form you hardly notice the slight bitterness of the greens. Raw collard greens hold up well to being wrapped. They don’t stay as well as rice wrappers, but with a firm hand you’ll be just fine. 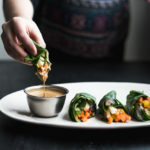 Of course, the sauce is one of the best parts of these tuna spring rolls. Made with coconut aminos, rice vinegar, and sunflower seed butter, it’s tangy, nutty, and slightly sweet. The sauce isn’t crazy thick (picture above provides proof), and trust me…you’ll find yourself double dunking. It’s inevitable. Finally, make sure you opt for sashimi-grade tuna so you’re safe to eat it raw. If you can’t find that, sear the tuna before you use it. Preheat a skillet to medium-high. Add a teaspoon or two of extra virgin olive oil. Cook the tuna for about a minute on each side. Then let cool slightly and slice for the spring rolls. That said, raw tuna makes these rolls more sushi-like, and that’s a sure gateway to my heart. Add all dipping sauce ingredients to a blender and blend until smooth. Pour into a bowl and set aside. Prep the collard greens by carefully cutting the spine out of each collard green leaf, essentially cutting each leaf in half vertically. 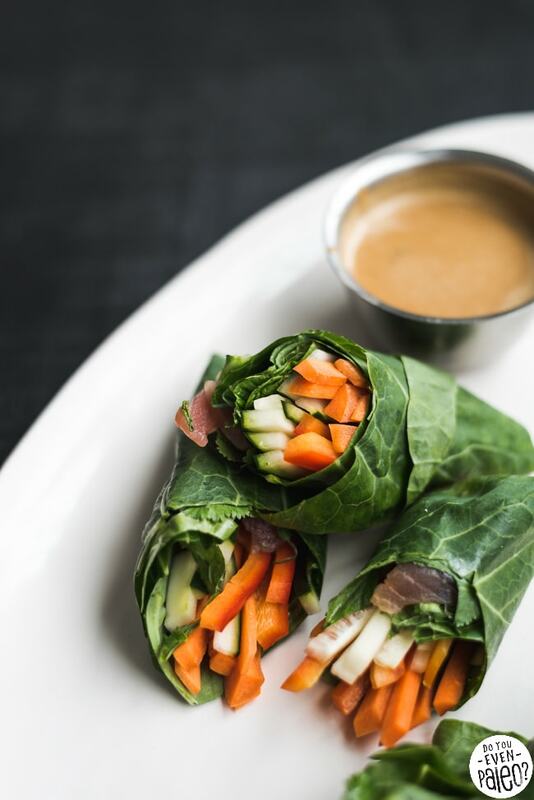 It’s way easier to roll up these spring rolls without the spine snapping! Slice the tuna thin. 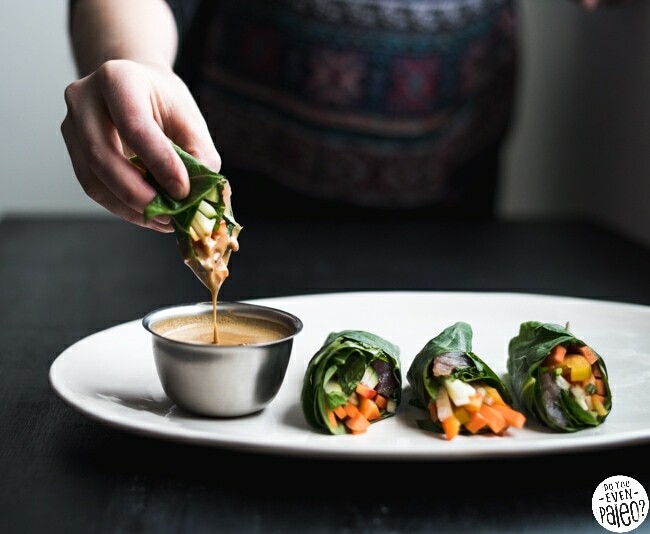 Arrange all the spring roll ingredients within reach – you’ll be using everything to make the rolls! Place a few carrots, cucumbers, bell pepper slices, mint leaves, cilantro, and pieces of tuna about 1/4 of the way up a collard green leaf. Tuck the shorter end tightly around the vegetables and tuna, continue rolling tightly. 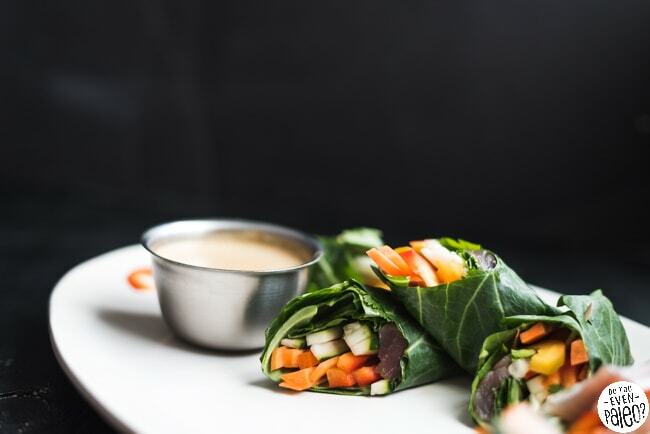 Unlike rice paper rolls, collard greens won’t seal themselves. 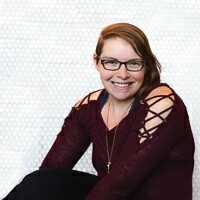 Place them seam side down or use a toothpick to hold them in place. Don't subscribe All Replies to my comments Notify me of followup comments via e-mail. 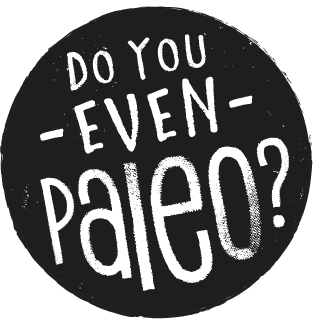 You can also <a href='https://www.doyouevenpaleo.net/comment-subscriptions/?srp=3524&srk=87505361eee98908ddf6ccb8681f50d6&sra=s&srsrc=f'>subscribe</a> without commenting.